King Mohammed VI has congratulated Moroccan football club Raja of Casablanca for winning the 2018 CAF Confederation Cup. 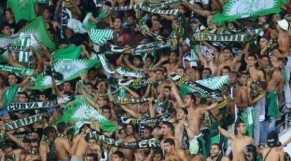 It is the sixth CAF title for the Moroccans, who have also won the Champions League three times and the Super Cup once. The Moroccan club grabbed on Sunday this new title after defeating in Kinshasa Congolese AS Vita Club, 4-3 on aggregate. In their first leg game played last week in Casablanca, the Green Eagles beat the Black dolphins 3-0 but lost their second leg match 3-1. This score was enough for the Moroccans to bring home their second ever Confederations Cup title after the one gained in 2003. The victory of Raja club enhances Morocco’s chances to host the 2019 Africa Cup of Nations after of CAF decided last week to withdraw the organization of the upcoming Africa Cup (AFCON) from Cameroon for security raisons and unfinished infrastructures. Egypt and South Africa are also serious contenders for hosting the African tournament. Egypt, which hosted the event in 2006, has only two major stadiums, which cannot accommodate 24 teams.